my old enterzone pal Martha Conway has been tweeting things lately with hashtags like #writeprompt and #10minprompt and #amwriting. writing, Games, long story short, Social Design Comments are off for this post. 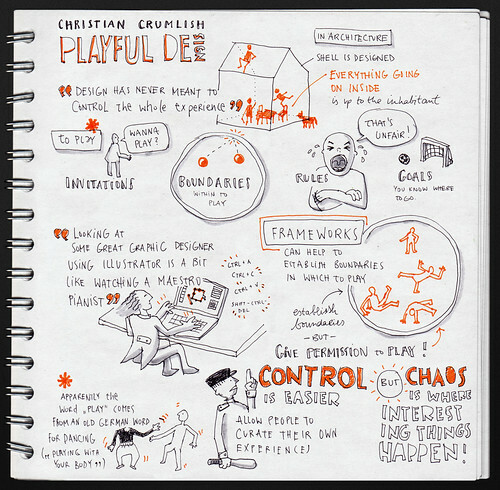 Christian Crumlish: Playful Design at UXLX, a photo by evalottchen on Flickr. Here are my slides from UX Lx. In the coming weeks, the video broadcast will be made available (for a small fee) at the UX Lisbon site, and sometime next year they will be shared freely in the ramp up to UX LX 2012.
design for play, playful design, slides, uxlx, Design, Games, Information Architecture, Social Design, User Experience Comments are off for this post.